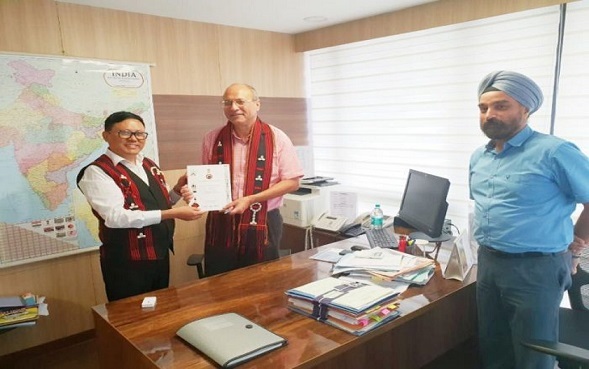 The Nagaland finance department submitted its report on “Statements Relating to State Finance”, “Topic Notes Relating to State Finances”, “Schedules & Notes Relating to Local Bodies” and a state memorandum to 15th Finance Commission secretary Arvind Mehta on Thursday. The department, headed by its secretary Y Kikheto Sema, submitted the report as per the instruction of 15th Finance Commission to submit reports and memorandums in advance on Thursday. Kikheto said the recommendation of the 15th Finance Commission was important as it would decide the fate of state’s financial position from April 1, 2020 to March 31, 2025. Kikheto said Mehta expressed his happiness at the timely submission of report by the state and agreed to accept any “supplementary memorandum” from the state, if needed. The secretary said the department was likely to submit supplementary memorandums to the FC as it had agreed to accept them. He said the FC is tentatively scheduled to visit the state in the last week of November this year and that the state government was preparing to warmly welcome the team. The Finance Commission is a constitutional body that makes recommendations to President of India regarding distribution of the proceeds of taxes between the Union and States and determination of principles that should govern grants-in-aid of revenues of the states out of the Consolidated Fund of India and sums to be paid to the states by way of grants-in-aid.